&quot;Darwin&quot; tells us about his voyage. 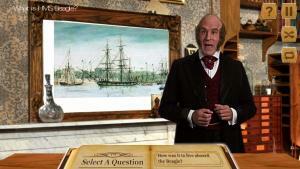 Last week I posted a review of the Synthetic Darwin Interview, a new award-winning app that lets you ask Darwin questions about everything from “What’s your middle name?” to “Would you approve of applying your theories to the social sciences?” There are 199 pre-loaded questions in all, and Darwin (in the form of a talented character actor) responds to each one using words taken from Darwin’s own writings. What I didn’t tell you earlier is that originally this “interview” took the form of a large-screen interactive museum exhibit at the Pittsburgh Science Center and the American Philosophical Society Museum in Philadelphia. Later, the Pittsburgh public schools adapted the technology to a desktop format suitable for classroom use.The app version, released just this month, makes the experience of chatting with Darwin infinitely more accessible. The whole project is the brainchild of John Pollock, Emmy-award-winning producer and neuroscientist. I got a chance to ask him some questions, and his responses (edited for clarity) are below. Stephanie Keep: What inspired and drove you to create the Synthetic Darwin Interview? Did someone approach you with the idea, or did you come up with the idea and approach museums? John Pollock: It was entirely my own idea, though strongly influenced by the predecessor “Ben Franklin’s Ghost” project produced by the Entertainment Technology Center in 2005 at Carnegie Mellon University. As for what drove me to do this, it is that people don’t know that Darwin was a boy, a man, a loving husband and father—they just know him as a scientist…if they know of him at all. Here’s a little story. I had an executive from a local (prestigious) company mention to me, while she was trying out a demo of the Synthetic Interview, that they had no idea that Darwin was English. Darwin is one of the most important scientific figures of all time. My goal was to let audiences converse with him and hear his story and accomplishments in his own words (and English accent!). SK: What was your biggest frustration in putting this together? Free-form questions aren't practical, so instead, users select from the app's preloaded options. JP: Well, obviously I’d love to be able to let the audience ask free-form questions—that’s the dream, but there are limitations to what we could do. At the time that I was planning this in 2007 the iPad was not yet released, and Siri did not exist. Now, of course, there is not only Siri but IBM Watson, a computer that can play Jeopardy! Thanks to these remarkable “beings,” the public thinks you should be able to ask a computer or avatar a free-form question and expect an answer. But for lots of reasons, most of which are obvious, we could not technically achieve that with Darwin at this time. For one thing, Siri and Watson get things wrong and can seem pretty stupid. I knew that we could not ever let our synthetic Darwin seem stupid, as that would be the chink in the armor of its credibility; the audience would have doubts about other things that he was saying. 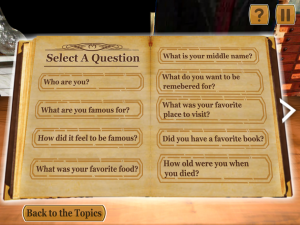 SK: You asked more than 1,000 adults and K–12 students, “If you met Charles Darwin what would you like to ask him?” and then pulled the 199 most frequently asked questions into your app. Did any of those top questions surprise you? Were there any questions you were sure would get asked that didn’t? JP: My biggest surprise was that a lot of people didn’t immediately know who we were asking about! I guess that the average person needs to be primed with a picture of old man Darwin or the word “evolution.” As for those that did know whom we were referring to, I was surprised that so many kids (and adults) wanted to know if he was a good student (he wasn’t) and if he had a pet (yes—a dog named Spark as a boy. In fact, he practically always had dogs, except when he was on the Beagle—a ship named for a dog). These types of basic family and life questions were unexpected, but very welcome. SK: Whenever possible, you used Darwin’s own writings as source material for his answers. Do you think that any of his answers will surprise users? In other words, do you think that perhaps the public will learn that we don’t know Darwin as well as we think we do? JP: The simple answer is absolutely! How many people know that Darwin married his cousin? Or why? That he was constantly seasick on his great five-year voyage? Even among scientists and biologists who know the principles of evolution, I think little is known about the man and his life and his inner thoughts. SK: If you could ask Darwin anything, what would it be? JP: I’d like to know when he realized how tectonic his ideas were on the landscape of biology. SK: What is your favorite piece of Darwin trivia? Mine is how he’d slice large books down the spine to make it easier to read in bed! I find that so endearing. JP: My favorite story is how he was eating a rhea (while traveling in South America) when he realized that it was a species that had never been identified. He proceeded to pull the carcass from the garbage and preserve what he could. I love that on so many levels. It tells you he was constantly observing and asking questions of the world around him. SK: And that he had an adventurous palate! What do you most admire about Darwin? Darwin explains sexual selection. JP: I have a very deep appreciation for how he must have spent a tremendous amount to time thinking about what he had seen. These days, so many scientists forget to take the time to think. We’re all in such a rush (often for essential reasons), but it is a shame that we can’t ponder what we see, take time to look some more, and then think about it all again. Darwin took years doing just that. Our modern science culture really does not allow that. SK: What do you hope to accomplish with this app? JP: I want to make it easy for anyone who is inquisitive to learn about Darwin the man. I’d also like people to begin to understand that evolution is a fundamental principle of science equal to and as unbending as gravity, and that understanding and accepting evolution does not need to dilute one’s faith. 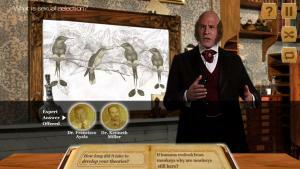 SK: What do you think Darwin would make of this app? JP: I think he’d be tickled, pleased and a little embarrassed. If you are interested in chatting with Darwin yourself, the app is available through iTunes, Google Play, and the Amazon App Store. The full version costs $9.99 and a “lite” version (with about 20% of the questions) is available for free. For educators, lesson plans to accompany either version can be downloaded here. Are you a teacher and want to tell us about an amazing free resource? Do you have an idea for a Misconception Monday or other type of post? Have a fossil to share? See some good or bad examples of science communication lately? Drop me an email or shoot me a tweet @keeps3.